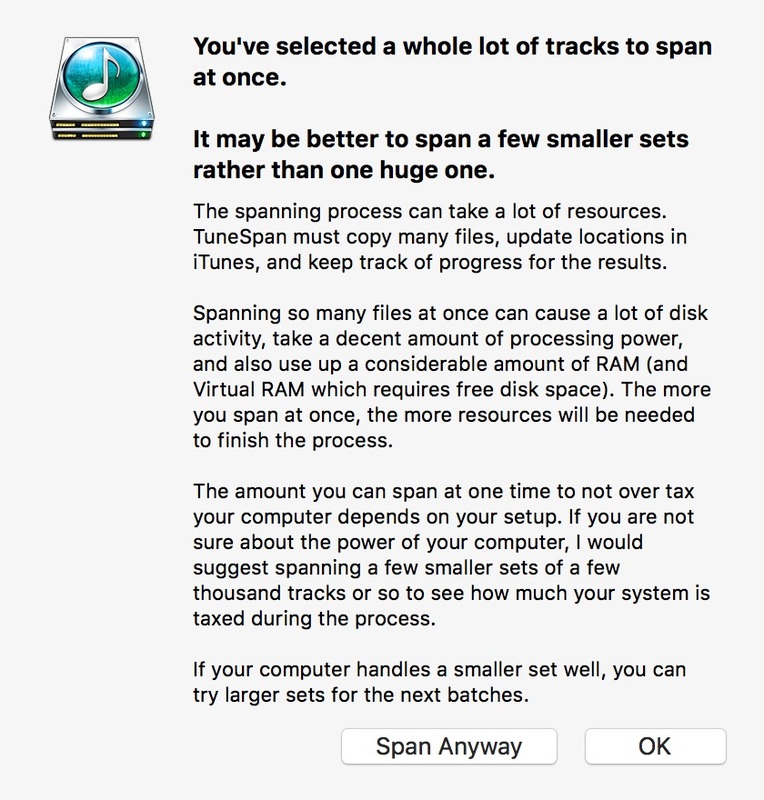 How do I completely uninstall Tunespan? Do you have spanned tracks that you want undone? Or do you just want the app gone? If you want to undo anything you've done in TuneSpan, you'll need to use the Restore Mode in TuneSpan to restore your spanned tracks. I would also like to restore my library to original condition and return spanned tracks and video to local drive. When I am connected to the spanned location filesystem and start TuneSpan, there are no spanned tracks or videos in the filter. However, when I go to play some tracks, I get a location not found in iTunes when the external filesystem is not mounted. Please advise. You can see from this I have 5k+ tracks and 40GB on the external place. It should not be this difficult. Restore should restore, but your first prompt says select and Span and set location. I am concerned about setting the correct level of folder. Is it username/Music or username/Music/ITunes or another? Since TuneSpan does not have a record of the original location (since they are not marked as Spanned) then you'll need to use Span mode and set the Span Location to your "~/Music/iTunes/iTunes Media/" folder. Since you are spanning a lot of tracks, I recommend splitting into two batches of around 2500 each.